Leo Stein; Henry Kleeman; Curt Valentin [1902-1954], New York; Curtis O. Baer [1898-1976]; by descent to Dr. and Mrs. George Baer; designated purchase by NGA with funds contributed by Walter H. and Leonore Annenberg, 1990. Picasso Drawings, The Art Museum, Princeton, 1949, no. 4. Six Centuries of Master Drawings, State University of Iowa, 1951, no. 212. Symposium of the Graphic Arts, Wesleyan University, Middletown, CT, 1955. 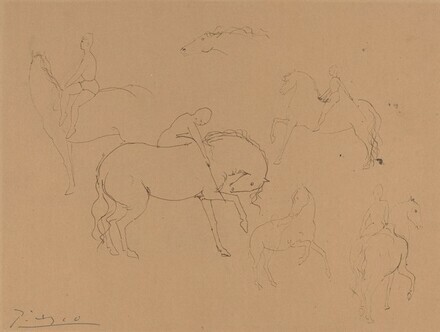 Drawings from the Collection of Curtis O. Baer, Fogg Art Museum, Cambridge, MA, 1958, no. 53 (cat. by Agnes Mongan). Master Drawings from Titian to Picasso, The Curtis O. Baer Collection, National Gallery of Art, Washington, and tour, 1985-1987, no. 90 (cat. by Eric M. Zafran). Art for the Nation, Gifts in Honor of the 50th Anniversary of the National Gallery of Art, National Gallery of Art, Washington, 1991, p. 334.